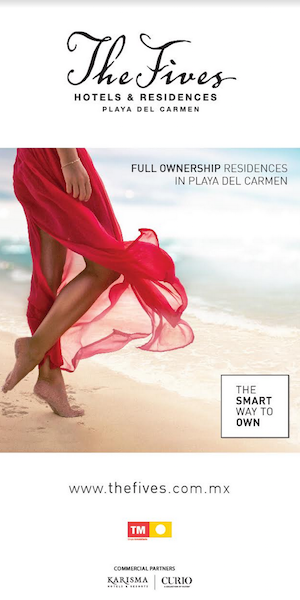 If you are looking for a rich cultural escape look no further than Mexico. We’ve scouted the top 5 colonial towns for you to explore in 2018. Arcangel Parish is the hallmark of this city, a beautiful temple of the end of the century. 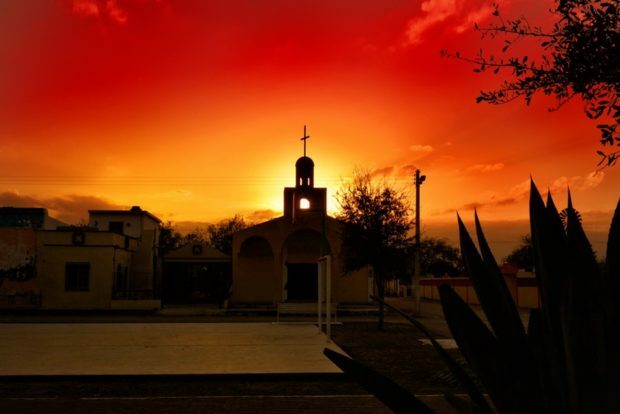 Must see: Reader, Kenya Trejo from Denver, recommend people must visit the San Miguel Arcangel Parish. “It is so pretty, it looks like a castle!”. Considered the city’s patron saint, the structure dates back to the middle of the 16th century, with a neo-Gothic façade being the tallest building in the city. At night you can gaze at the beautiful bell tower, turret and gargoyles that are accented by the bright lights at night. “El Mercado de Artesanía is highly recommended!”, adds Kenya. “You’ll find lots of souvenirs made by hand”. The weekends, the market is bustling with colorful booths and local handicraft. You can find endless silver jewelry, local gemstones, textile, ceramics and more! El Santuario de Atotonilco is another jaw-dropping church. From the outside, it may seem like nothing special, but as another UNESCO World Heritage Site, nothing can prepare you for the exquisitely painted ceilings. Murals cover every inch of the church. Alborada. Pozole is a Mexican stew made of beef or chicken, that include hominy and a green or red Chile broth base. It is seasoned with oregano and other spices and topped with cabbage, lime radishes, and sliced avocado. This beautiful town established in the 1500’s was known asa stopping point for traders traveling between Europe and Asia. 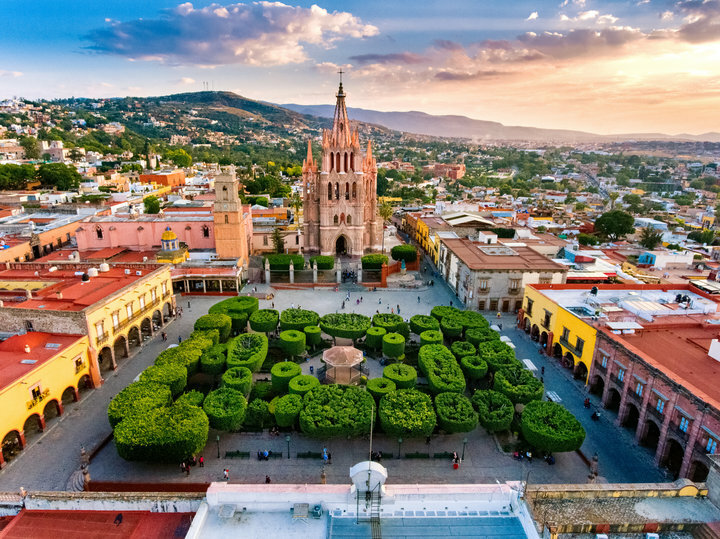 The city has influences of Islamic, Aztec and Art Nouveau design. gastronomy, Puebla is on the top choice for foodies and art connoisseurs. 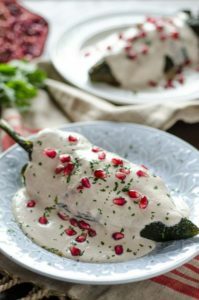 Chiles en Nogada, a quintessential dish, it consists of a poblano chile peper filled with chicken and topped with a creamy walnut sauce topped with pomegranate seeds and parsley. The dish incorporated the three colors of the Mexican national flag. Mole Poblano, is one of Mexico’s most famous dish, it is a chicken dish made with a combination of chiles, spices, and chocolate! This dish is a fusion of European and Mestizo cultures. Cemitas, a Mexican sandwich typically filled with avocados, quesillo (cheese from Oaxaca), pork milanesa, onion and chipotle. Must see: Historic Downtown, visit the City Hall and Ampario Regional Museum. Don’t forget to stop by the Catedral Basilica, an iconic sight in the city. Stroll over to Sapo Square, it’s surrounded by old colonial houses and facades of beautiful balconies and gates that date back to the Viceroyalty. The Artist Neighborhood, if you’ll find this square with several workshops and exhibitions. The Analco Neighborhood is one of the oldest parts of Puebla and cannot be missed while on holiday. was named a UNESCO world heritage site, where one can find mummified bodies, a famous attraction to the city. Callejonadas. “alley walks”, these theatrical tours sponsored by the university’s theater department saunter through the streets singing and dancing. Historic sites provide the pit stops along the way as the band plays and sings traditional songs. Crowd participation is a must. 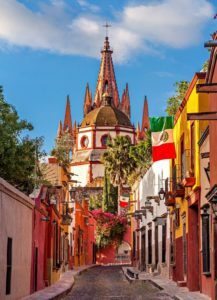 Although the tours are in Spanish, and it may be difficult for non-speakers to understand, this is one of Guanajuato’s truly unique offerings and is not to be missed. Plaza de San Fernando. A great place in the center of the city to go for any meal, an afternoon coffee, or a great craft beer. A dozen or so restaurants and cafes line the plaza. Enjoy sitting out in the open air, people watching and listening to the myriad of local musicians. This is the perfect place to try Guanajuato’s local specialty, enchiladas mineras. Mercado Hidalgo. An indoor market set in a beautiful old building where you can find just about anything you could need. A great stop for local meat and produce as well as handicrafts and souvenirs. The building is also surrounded on the outside by vendors and food stalls where you can stop for a delicious meal. Alhóndiga de Granaditas. One of the most iconic buildings in Guanajuato, the former granary turned prison is now host to a regional museum and is definitely worth visiting! 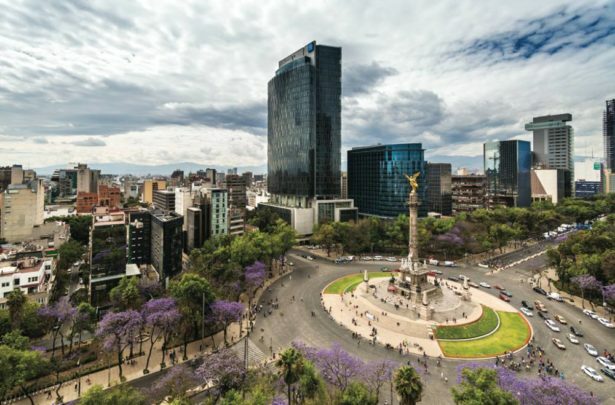 Full of national and regional history, this is a great place to learn about the Mexican independence movement and about the indigenous cultures that lived in the region. Zacatecas is a world treasure known as a World Heritage Site for its architecture, its pink quarry stone gives this Mexican city its magical charm. This colonial town bustling with tourist provides visitors with historical, religious attractions in addition to numerous festivals and an incredible view of the Cerra de la Buffa and Cerro del Grillo. 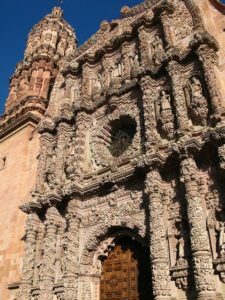 Festivities: Reader Ana Garcia from Denver, CO, shares her experience on Christmas traditions in Zacatecas, “People are very religious, and they celebrate baby Jesus on Christmas. Starting December, they will invite people over to pray a rosary and celebrate baby Jesus by praying, chanting, bathing him, and then setting the Christ figurine in the nativity scene, which is more common to see than a Christmas tree in all households. The host family will provide guests with sweet along with traditional dinner of pozole and tamales as a thank you for participation”. Must see: “Cerro de la Bufa, this sight will give you a 360 view of the city and its beautiful cantera, quarry stone buildings”, says reader Ana Garcia from Denver, CO. From there you can catch a teleferico, a cable car to La Mina de Eden mines. They amazing tour during the daytime, and it becomes a dance club at night. Ana also recommends readers to take a day and/or night tour of the city to get a narrated history of the city and its legends. Other must-sees include Mezcals tours and tastings, Mezcal is an alcoholic drink made from the agave plant. You can book mezcal tours that take you to the Hacienda la Pendencia. Exploring the La Quemada, ruins that date back to pre-Colombian era. Take awe at the old volcanic stone walls and lose yourself in its labyrinthine walls. Food: Reader Ana Garcia from Denver, CO recommends “Gorditas and Birri”. Birria, a Mexican stew year round but especially a favorite during the holidays. It made traditional with goat meat ( or chicken or beef) or mutton that’s been marinated in spicy sauces and herbs for hours. center, art nouveau, global cuisines and numerous museums throughout the city. optional. Some other staples favorites in Mexico City are Bacalao, a codfish, Pozole, a spicy chicken or beef soup with hominy and garnished with onion, cilantro cabbage, and oregano! Buñuelos, a large flattened fried flour tortilla that is sprinkled with cinnamon and sugar, a classic Mexican staple every Christmas. Coyoacan for their food, and because they are very European like and safe to walk around even late at night. Xochimilco deserves a visit for its beautiful colors and how unique it is. Visit their mercados, variety of markets that range from flowers, food, and sweets”. 6 Tips To Reach Your Fitness Goals!